June 16 was Free RPG Day, and The Critical Hit Show definitely did their part. Eric Fell ran a 4th Edition game at Strategies in Vancouver. The Adventure was called “The Road to Korlak,” and people could play as 3rd level versions of the characters from show. 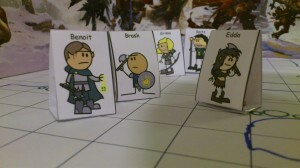 Artist Danny Laycock used his magical Photoshop skills and customized some Order of the Stick standees to represent the players. I think he captured their distinctive personalities quite nicely! Six people wound up in the group, so the oft-mentioned, rarely seen Elfy McShootfast joined the adventure as well. It was a fantastic session, and we’re so glad so many people came out to play and watch. The adventure is currently being rewritten for public consumption and will be up on the site soon! Promise! Oh, and by the way, tickets for the June 27th Critical Hit Show are on sale now. $6.00 advance and $8.00 at the door!